Why does the Division need adopters for desert tortoises? The Division’s Desert Tortoise Adoption Program exists so that families and individuals can adopt captive desert tortoises, allowing legal possession of an extremely special, protected species. During this year’s round of adoptions, one of the tortoises in our program — dubbed Big Red — presented red paint on his shell due to human cruelty. A 12-year-old boy with radiant red hair and freckles came to select a tortoise and fell in love with Big Red. It was wonderful to see the tortoise engaging with him — this was a true pet connection! A burrow is among the items an adopted desert tortoise needs. Habitat loss continues to threaten the tortoise population, as well as a context-dependent disease called upper respiratory tract disease (URTD), which presents like a cold. Adopting a tortoise is a win for both the family who’s adopting the tortoise (they’re the coolest pets!) and the tortoise because the sick ones who have been pulled from the wild can’t go back. The risk of spreading the URTD disease is too great. The program gives the animals a place to live out their days. You’ll find desert tortoises in the Mojave and Sonoran Deserts of California, Nevada, Arizona and Utah. This reptile can survive as long as 60 to 80 years. Much of the tortoise’s water intake comes from moisture in grasses, forbs and wildflowers like dandelions. Tortoises are famous desert hole-diggers who excavate burrows where they can escape the heat and take shelter during hibernation. They make great pets because they hibernate in a cool, dark place five months out of the year. 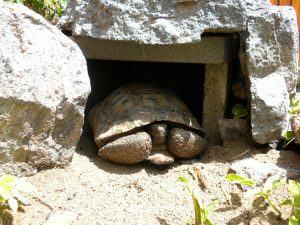 Proper habitat accommodations for a tortoise include a completely fenced area with a burrow, water and food dish and plenty of sunshine and shade available to the tortoise. Hatchlings and juveniles must be kept indoors in a terrarium with a UVA/B light. UVA light helps regulate behaviors such as feeding, diurnal movement, mating and similar activities. UVB light allows the synthesis of vitamin D3, which helps to absorb calcium. UV bulbs need to be on during the day and turned off during the night to mimic daytime and nighttime. If you see a tortoise in the wild, it is important that you leave it alone and offer it plenty of space. A tortoise will “void” its bladder when frightened and this could have life-threatening consequences for the animal if it’s not able to replenish its water supply. Handling wild tortoises, removing a tortoise from the wild and/or releasing pet tortoises into the wild are all illegal under the Endangered Species Act. Caring for a tortoise is like having your own desert dinosaur in the backyard, and it might even outlive you! If you’re interested in learning more about the Desert Tortoise Adoption Program, please feel free to contact me at tortoise@utah.gov. Pets assume vital jobs in our lives, and regardless of the amount we love our furry friends, they will, in general, shed their fur. Analysts have discovered that in a few occurrences, creature hide is the base reason for respiratory issues by individuals living with pets. To stay away from such predicaments it is important to furnish yourself with proper tools to rid off pet hair and keep up cleanliness in the family unit and keep your family protected from pet fur related important.